What is Casa Navona ? 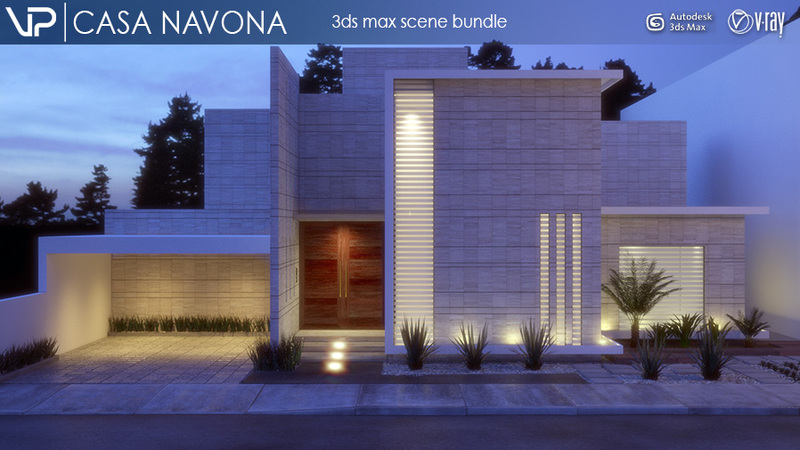 CASA NAVONA is 3ds max scene, created with the help of VIZPARK products, including Walls & Tiles, Crossmap, HDRI Skydome 04, several textures and plants. The scene is inspired by real architecture from Ji Studio. 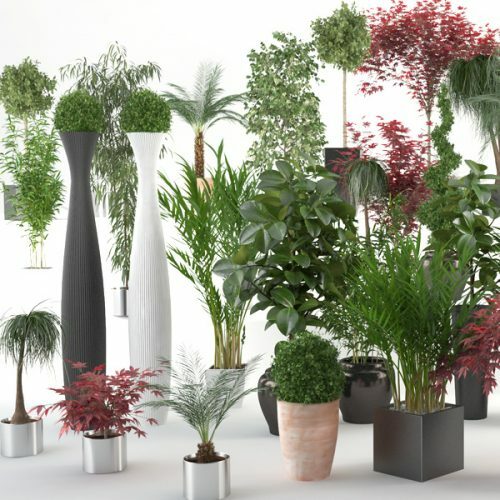 With respect to the intellectual property of Ji Studio, the complete scene is intended for tutorial purpose, while the included content (3d models and textures) from VIZPARK can be used for any commercial project. If you own Walls & Tiles 1.3, you can use this scene to learn how to use the plugin. 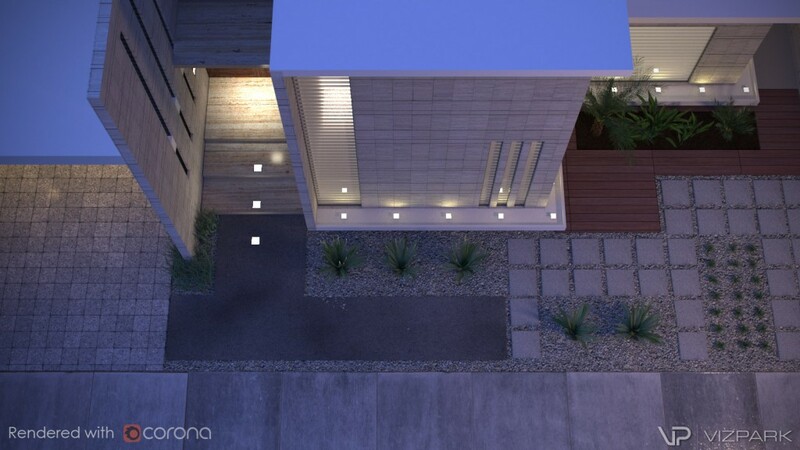 The walls and garage floor is made with Walls & Tiles while the sidewalk, door, and other parts are textured with the help of Crossmap to create more variation. The purpose of this scene is to learn a typical use-case of Walls & Tiles and Crossmap. Of course you can also use the base scene for your own architectural masterpiece. Just replace the house with your own model and render. The Casa Navona 3ds max scene is a learning resource, a base scene for your own architectural project and simply put … a teaser bundle of VIZPARK textures, models and a hdri sky dome. 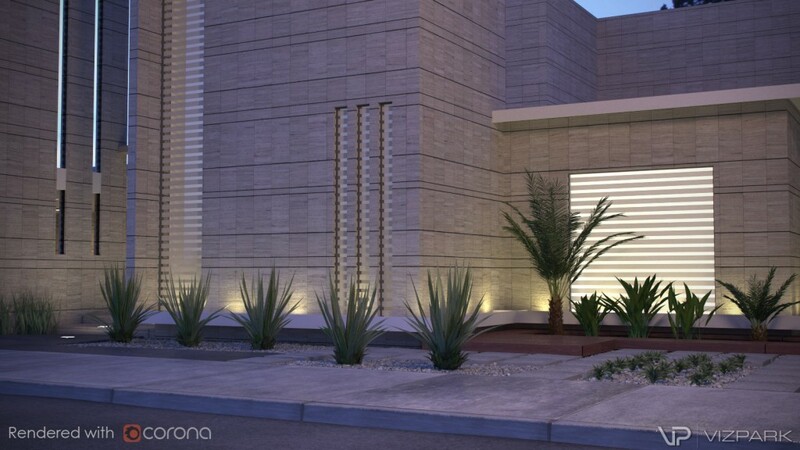 The scene is prepared as 3ds max 2011 file and requires WALLS & TILES 1.3 and VRAY 2.0 or Corona Render 1.0. You can also use this scene without Walls & Tiles, but you won´t be able to use the included materials for the brick walls and floors. 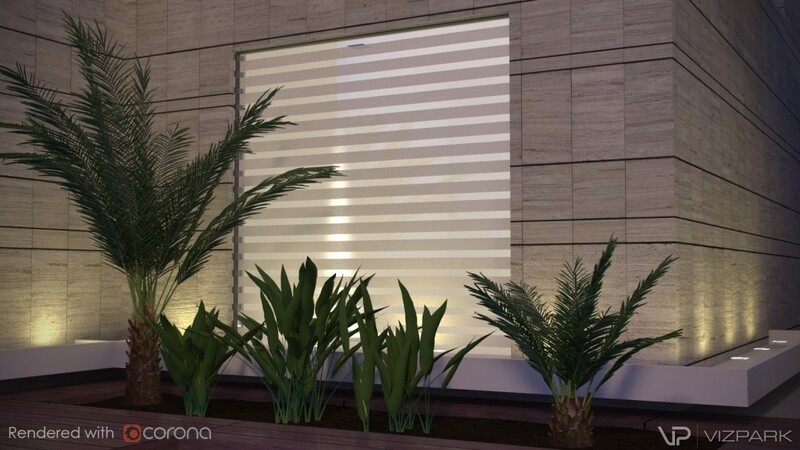 You may also download the FREE Walls & Tiles Lite Edition and load the scene as it is. Using the free Walls & Tiles Lite Edition will give you some restrictions though (for example only three bitmaps can be loaded per material). This image illustrated the use of Walls & Tiles and Crossmap. All BLUE AREAS are created with Walls & Tiles materials and all GREEN AREAS are created with Crossmap. Walls & Tiles was used to create a custom bond pattern for the walls of the house. An unusual but special bond which gives the house a unique look. 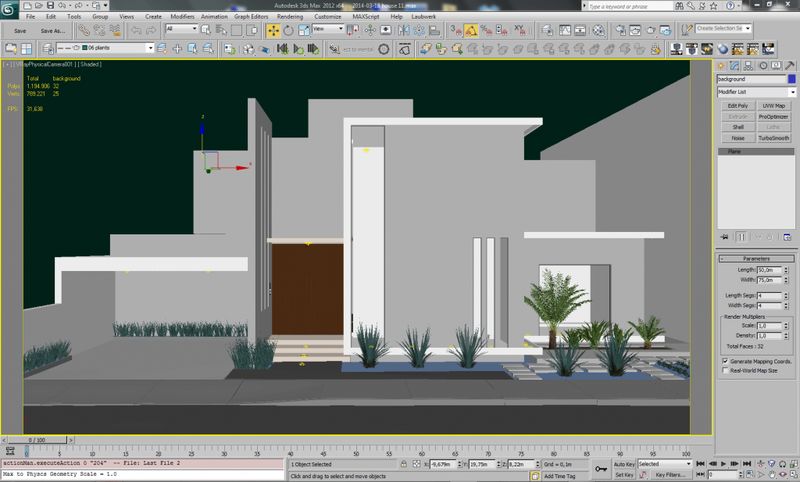 Crossmap was used to give the sidewalk, door and garden walk plates some more variation to avoid repeating textures. 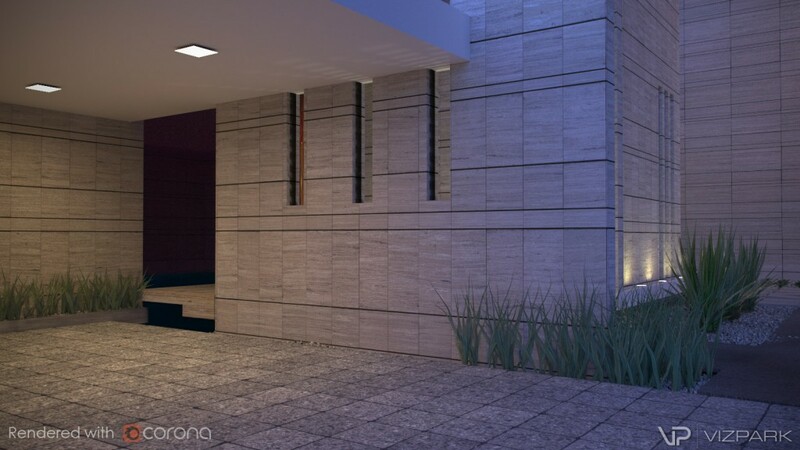 The scene file uses Walls & Tiles 1.3 and Crossmap for some materials. If you don´t own Walls & Tiles 1.3 (which includes Crossmap full) then you won´t be able to properly load and render the scene with the Walls & Tiles and Crossmap materials! You may also use the FREE Walls & Tiles 1.3 Lite Edition including Crossmap LE, but this will only render the scene correctly, while you will be limited to the features of the LE editions. 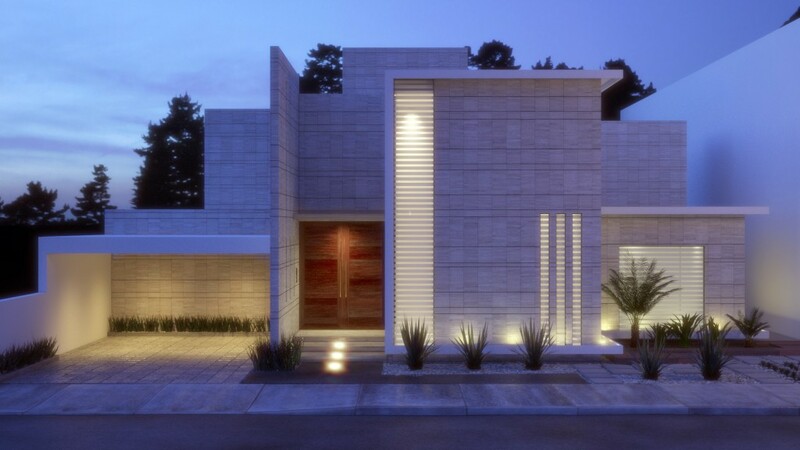 The architecture used in this product is copyrighted by the architect JI STUDIO. 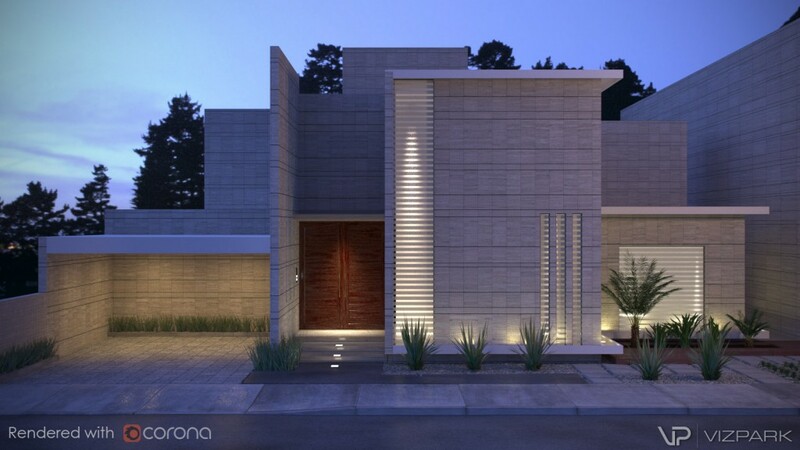 Don´t use this architecture (the house model) as your own and don´t publish images using this house. You can of course use any other parts of the scene, but not the house model itself for commercial publishing. Used as study material, it’s an excellent source for learning correct lighting techniques, and material creation. Simple, yet effective. It-s a example fantastc to present the materials dfferent used on the scene. Nice looking scene. The lighting comes from HDRI Skydome 04 looks realistic. Thank you VIZPARK! Great free scene with included models and textures. Przydała by się jeszcze wersja uniwersalna w formace FBX/OBJ… jest to darmowa scena do celów testowych, NIE DLA KOMERCJI! ENGLISH TRANSLATION: Would still handy universal version of Formac FBX / OBJ … this is a free stage for testing purposes , not for commercialism ! There are a few night scenes all over the net. So When I found this, I downloaded and tried it yesterday evening. I used this model to learn how to set cameras, an lights, is very usefull for beginners like me, trying to get familiar with al the 3d modeling enviroment. Great free scene with included models and textures. 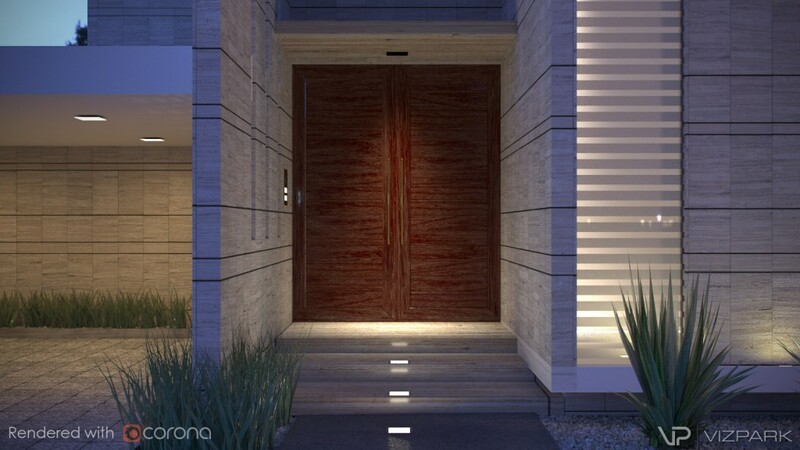 Good intro to plugins and Corona renderer. The best technique used to render. I liked it. Beautifully done! VizPark has some the best quality models I have seen. Fantástica aportación para perfeccionar mis técnicas de trabajo. Mil gracias. ENGLISH TRANSLATION: Great contribution to perfect my techniques work. Thousand thanks. Good training scene for me. Nice!